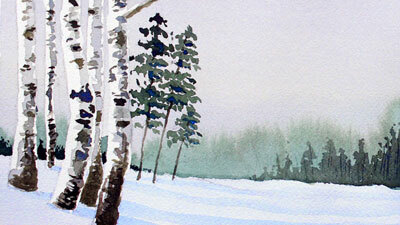 Choosing the right paper for a watercolor painting is often an important step to success. 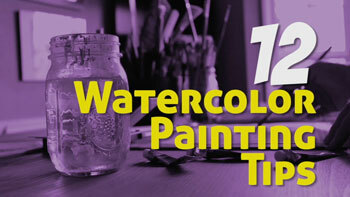 Watercolor papers come in many different forms and sizes and will affect the nature of the finished painting. Knowing which paper to choose for your project is important for any watercolorist. Watercolor papers range in price and quality. Some papers are made from wood pulp and are machine pressed. Paper made from wood is generally a lower quality than rag paper and as a result, is less expensive. That's not to say that these papers cannot produce beautiful results. Other papers are made of 100% rag and are considered a higher quality. Many of these papers are handmade and are more expensive. Higher quality papers will generally be marked in one of the corners of the paper. This embossed mark is called a watermark and will tell you the name of the manufacturer of the paper. You can see this mark by holding the paper up to a light. Each one of these categories refers to the "tooth" of the paper. Tooth is the surface texture. Hotpress papers have a smooth tooth, coldpress papers have a medium tooth, and rough papers have a coarse tooth. Hotpress papers are not completely smooth. They must retain some texture to accept the paint. They are, however, the smoothest of the watercolor textures. Because of the smooth surface, hotpress papers are best suited for fine controlled lines and brilliant colors. The smoother surface causes the paint to dry quicker making hotpress papers a bit more challenging than the other types of surfaces. Coldpress papers have a medium tooth. Because of this, you can work a bit slower without fear of quick drying times. The tooth is still smooth enough to work without loss of detail. This makes coldpress papers a popular choice for watercolor beginners. Coarse-grain papers feature an extremely rough surface. These papers are so rough in texture that small valleys are created. Watercolor paint collects in these valleys slowing the drying time down. Beginners may find this paper a challenge to work with because it is hard to control the paint. However, professionals will find that the slowed drying time is a benefit. The weight of the paper is determined by how much a ream of the paper (22" by 30") weighs. A ream of paper is 500 sheets. So, if a piece of paper is 200 lb. paper, that means that is how much a ream of that paper weighs. Higher weights generally mean heavier tooth. Watercolor paper can come in various sizes and forms. Some manufacturers make pads of glued watercolor papers. These are referred to as watercolor blocks. Watercolor blocks are easily transported and can come in very small sizes. Some watercolor blocks are small enough to put in your pocket. A standard size for watercolor blocks is 12" by 16". Most watercolor papers are sold as individual sheets. You may notice that the higher quality papers have a deckled or rough edge. It is advisable to tear the paper to make smaller sheets in order to preserve a deckled edge. Most people find this deckled edge to be an aesthetic quality about watercolor paper.